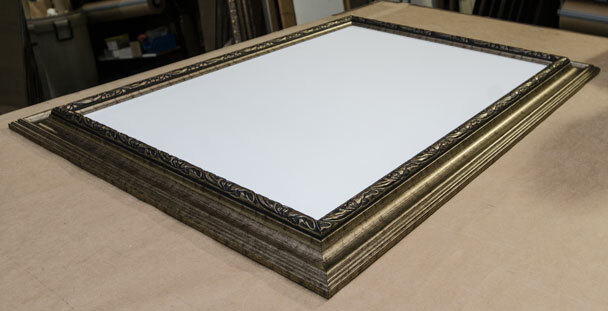 Custom gold frame for your canvas painting and artwork. Available in any size you need. What is a frame rabbet? The frame rabbet is the depth of the groove inside the frame that holds the artwork. 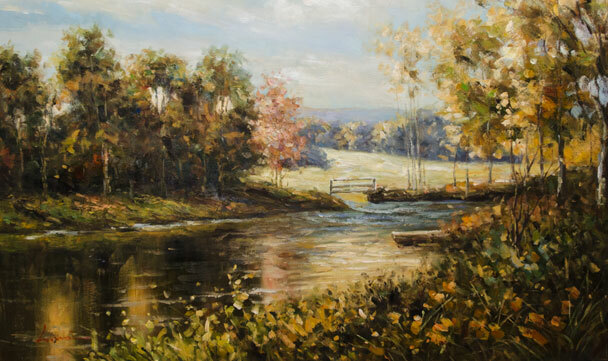 If the stretcher bar of your canvas artwork is 1 inch thick, we recommend getting a frame that has a rabbet of 1 inch or more so the artwork is flushed inside the frame. What is the frame width? The frame width is how wide the face of the frame. 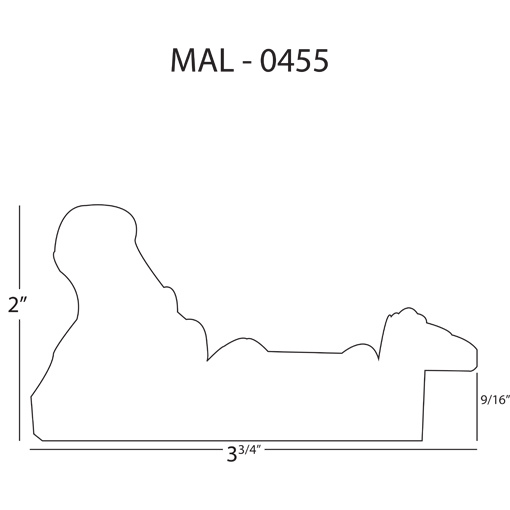 All of our frames have a detailed outline drawing of the frame width. Please see an example below of a frame that has a frame width of 3 and 3/4 inch. What size of frame to buy? There are 3 things you need to measure before you buy an open frame. The width and the height of your artwork, and thickness of the stretcher bar of your artwork. You need to measure how thick the stretcher bar is on your canvas artwork to know which frame rabbet will fit your canvas. 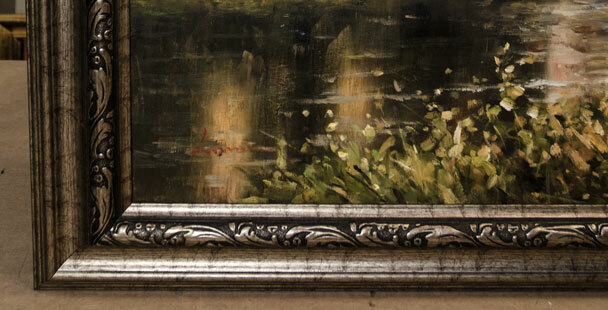 You also need to consider the width of the frame to know the final dimension of the artwork with the frame. The final outer frame dimension is based on how wide is the frame you select. Most frame orders are shipped in 3 to 5 business days. Shipping takes another 3 to 5 business days. When your order is shipped, we will send you an email with the tracking number to track the status of your package. Width: 16 in. 17 in. 18 in. 19 in. 20 in. 21 in. 22 in. 23 in. 24 in. 25 in. 26 in. 27 in. 28 in. 29 in. 30 in. 31 in. 32 in. 33 in. 34 in. 35 in. 36 in. 37 in. 38 in. 39 in. 40 in. 41 in. 42 in. 43 in. 44 in. 45 in. 46 in. 47 in. 48 in. 49 in. 50 in. 51 in. 52 in. 53 in. 54 in. 55 in. 56 in. 57 in. 58 in. 59 in. 60 in. 61 in. 62 in. 63 in. 64 in. 65 in. 66 in. 67 in. 68 in. 69 in. 70 in. 71 in. 72 in. 73 in. 74 in. 75 in. 76 in. 77 in. 78 in. 79 in. 80 in. 81 in. 82 in. 83 in. 84 in. 85 in. 86 in. 87 in. 88 in. 89 in. 90 in. 91 in. 92 in. 93 in. 94 in. 95 in. 96 in. 97 in. 98 in. 99 in. 100 in. 101 in. 102 in. 103 in. 104 in. 105 in. 106 in. 107 in. 108 in. 109 in. 110 in. Height: 16 in. 17 in. 18 in. 19 in. 20 in. 21 in. 22 in. 23 in. 24 in. 25 in. 26 in. 27 in. 28 in. 29 in. 30 in. 31 in. 32 in. 33 in. 34 in. 35 in. 36 in. 37 in. 38 in. 39 in. 40 in. 41 in. 42 in. 43 in. 44 in. 45 in. 46 in. 47 in. 48 in. 49 in. 50 in. 51 in. 52 in. 53 in. 54 in. 55 in. 56 in. 57 in. 58 in. 59 in. 60 in. 61 in. 62 in. 63 in. 64 in. 65 in. 66 in. 67 in. 68 in. 69 in. 70 in. 71 in. 72 in. 73 in. 74 in. 75 in. 76 in. 77 in. 78 in. 79 in. 80 in. 81 in. 82 in. 83 in. 84 in. 85 in. 86 in. 87 in. 88 in. 89 in. 90 in. 91 in. 92 in. 93 in. 94 in. 95 in. 96 in. 97 in. 98 in. 99 in. 100 in. 101 in. 102 in. 103 in. 104 in. 105 in. 106 in. 107 in. 108 in. 109 in. 110 in. Frame Width: All 1" to 2" 2" to 3" 3" to 4" 4" to 5" 5" to 9"